Although Kyoto is becoming cooler than the very hot months of July and August, you may still find yourself wanting some cool, refreshing food on a warm day. Zaruzoba may be just what you are looking for. You have probably tried hot soba noodles before, but have you tried eating them cold? Zarusoba is a dish comprised of cold buckwheat noodles served on a bamboo tray and topped with nori (seaweed). The noodles are dipped in a sauce called tsuyu, made from dashi and soy sauce and eaten. Green onion and wasabi may also be added to the sauce. Side dishes such as inari-zushi (seen in the above picture), rice, pickles, or tempera make this a delicious and refreshing summer meal. 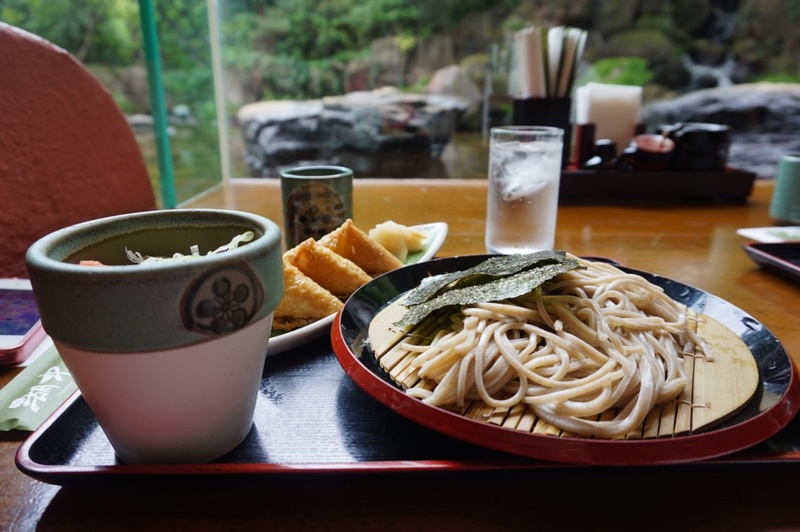 There are many delicious soba restaurants in Kyoto, so be sure to try them out this summer!